Home » Food & Lifestyle » Your Say: Are you monitoring your water intake? I have, and its given me health and beauty benefits! Your Say: Are you monitoring your water intake? I have, and its given me health and beauty benefits! We’ve all heard this before haven’t we? Drink more water to stay hydrated. Drink more water for better skin. Drink more water. Period. Its very simple actually. Get yourself a water bottle with a set measurement of how much water it will hold then keep it by your side at work and when you’re at home. I have 2 such bottles. The one I have in the photo holds just 800ml but I have another that holds 1125ml that I keep at work. At work, I try to ensure that I drink at least 2.5 of the large bottles spread out over a work day. That gives me about 2.2-3 litres of water, which is about the recommended amount. At home, I technically shouldn’t need a bottle to measure water intake, but I soon realised that I drink far less water at home than when I’m at work! So I’ve started this habit too. I just keep the bottle by me when I’m working or watching TV. I developed a rather bad headache while at work one morning and couldn’t find any Panadol on hand. I don’t normally get headaches or migranes for which I count myself lucky, but when I do I do feel terrible. I was planning to head home early but there were things I had to do so I soldiered on, while drinking my water at my desk. By mid afternoon, I was called out for a surprise meeting but it was then that I suddenly realised that my headache was gone! My head did still feel a little heavy but it wasn’t throbbing anymore. I soon found out that drinking enough water balances the electrolytes in your body and that sometimes, headaches are caused by dehydration. So drinking lots of water helped flush that away. We know we need to keep our skin hydrated inside and outside and sometimes, creams and lotions can only do so much. Dehydrated skin is also a sign you aren’t drinking enough water. Since I started monitoring my water intake, I have noticed that my skin is better than before even while using the same set of skincare that I have for months. Less problem with flaky skin and hydration levels. One of the places that show dehydration most quickly is your lips. The skin on our lips is very thin and very delicate. When I started monitoring my water intake, I realised that the sporadic incidences of chapped or dry lips were no more. I’d wake up with supple lips (I do use Lucas Papaw Ointment at night) and despite sitting in an air-conditioned office all day I didn’t have dry lips. I didn’t need a lip balm (I never use one anyway) and lipstick or lipgloss just looks so much better. So before you whip out your lipbalm next time you feel that your lips are too dry, consider your water intake instead. It could just mean you aren’t drinking enough water. That said, it is worth warning also not to overdo the water. It is possible to drink too much water and that upsets the balance of the electrolytes in your body which is also bad for health. One of my uncles once told me to never gulp down a large glass of water at one go, no matter how thirsty I was and particularly not after exercising. What I should do, is drink it slowly. It assuages your thirst better and doesn’t suddenly dilute your system. Also, don’t drink too much water at one go. If you are drinking a litre of water within a few minutes, that’s too much. As with everything in life, moderation is key. But I don’t like drinking water! 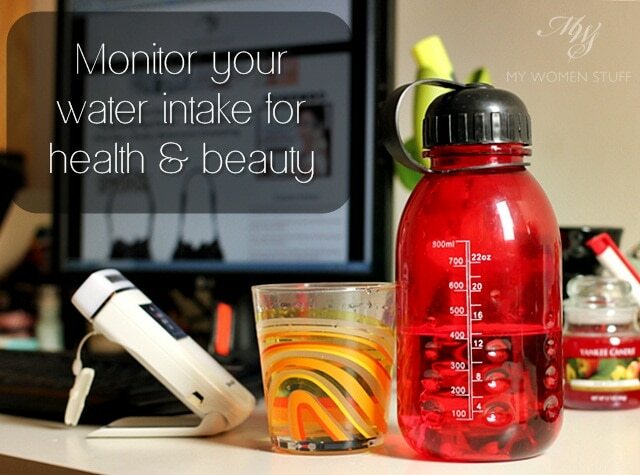 Do you monitor your water intake? Do you have a problem with the taste of water? Disclaimer: This is based on my personal experience and is meant to be for general information, not medical advise. Please consult your doctor for medical concerns and advise. wow great tips…i drink all sort of liquids…but normally im jus like you. Coffee in the morning and water rest of the day…sometime i like to drink tea which help clear my head! I have a water bottle with me at my desk at all times. I’m usually there all day so by the time I’ve finished one bottle, I know I’ve consumed at least 1 litre that morning and/or afternoon. It may not be a lot to most people but for someone who can forget to drink a drop of water all day, this is a lot. I find that a cup of hot water with a slice of lemon in it a great start to the day. I don’t think it did jack to “detox” me but I feel better in tackling the day. Makeup artist Rae Morris once told me that the sign of having consumed enough water is when your lips doesn’t need lip balm. Apparently when rescuers find people who are lost, the first thing they check for dehydration (next to pinching the skin) is to look at the condition of the lips! I drink ~3-4 liters a day. The truth is, once you start drinking that much, you can’t stop, otherwise you feel terrible all the time. a) Dislike the taste of room temperature/tepid water. If I am to drink water it either has to be hot or cold (preferably with ice). b) Prefer anything with flavour over regular ol’ plain water. c) Usually fail to get my recommended intake of water. d) Have a phobia of needing the loo and not being able to find one. e) Can ignore the fully loaded water bottle sitting on my desk for hours on end. I used to be terrible with my water intake, and my hubby used to complain that I’m like a camel – I can go on shopping without stopping for a drink of water! Btw, is that air purifier thingie in the photo of any use? I remember your post about it, am wondering whether I should go out and get it for my office! I have met the same sort of people. They will drink any manner of sugary drinks but not water. Its strange. 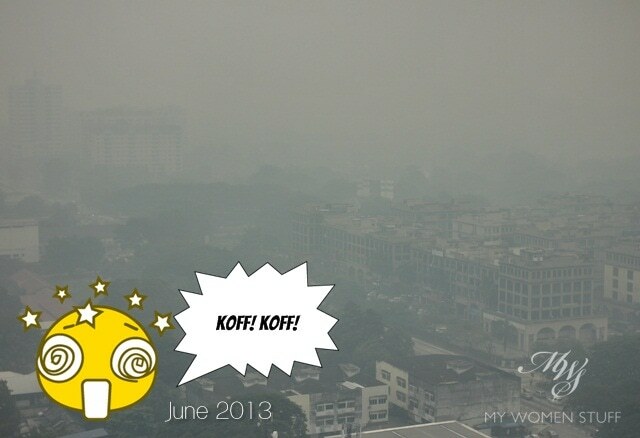 As for the air purifier thing, its actually not bad. I do feel that the air around me is cleaner and I think its actually best for hazy days or if you work in a carpeted office because those carpets can harbour a lot of mites! Hiya Rin, its actually a good sign that you notice what happens when you don’t have enough water! Many people don’t even realise it much less know what to do with themselves when they feel that way.when I’m feeling off, having sufficient water intake helps put me back on balance. Thanks for the tips. I definitely monitor my water intake and usually try to drink at least 1 litre of water in the morning and another 1 litre in the afternoon when I am in the office. I also try to drink a bit more during dinner. It is harder to monitor it at home during weekends and I need to improve on that. I also try to eat plenty of fruits everyday. I’m not so good about watching my water on weekends either, but the same bottle trick helps me a lot. Sometimes, I would forget that I haven’t had water if not for the bottle! Its good that you’re getting your mom into the water drinking habit. I think sometimes it could also be what we’re used to. If we aren’t used to drinking water, then the taste can feel bland. I don’t drink cold water on a regular basis. It is bad for health in long run. Lukewarm/warm water is fine. I only go for cold drinks when it is really hot out there. My friend once told me that drinking too much water would dilute your blood, haha. Hmm interesting thing about the blood, but I was told that too. But more of in the context of if you drink too much of it in one go. Also, too much meant a few gallons so I think most of us are safe 😉 I don’t take cold drinks either. Or if I do, very rarely. Yes, I do agree with the benefits of water! I find when I go back to my parents’ house in Malaysia, I drink way more water so my skin looks better. I need to get a bigger bottle here to make sure I get enough water. If you just constantly sip water instead of chugging it all at one go, you are less likely to need frequent toilet trips because you are merely replacing what water has been lost from your system. The reason why you need to pee after drinking a big glass of water is because your kidneys need to prevent your blood from becoming too dilute (which can cause muscle cramps, or in severe cases, brain swelling and death). I’ve never had a problem with drinking enough water, and I make sure both my daughters have that habit of drinking too. In fact, I love just plain water, be it warm or tepid or cold… more so than flavoured ones. Good to inculcate the water drinking habit from young! Thanks for the tip to drink water in the mornings. I try to do that but always forget 😛 tomorrow it is! I read its good to flush the system with it. Hahaha hey, clear pee isn’t gross at all! 😉 its quite an achievement, even hehe… I know who to ask for toilet directions next time, eh? If I’m traveling, I like to pop into hotels and use their restrooms. Its the only way I can be assured its cleaner than any other public toilet! I love water! I especially the taste of boiled tap water (in Singapore only), and Evian mineral water. I guess I am one lucky one who actually seriously like drinking plain water. And I realise that keeping the bottle or jug of water transparent, and right by the laptop really helps to increase water intake. Ooh good idea about marking the time of day. I try to have finished a bottle by lunch and then another bottle and a bit by the time I go home. The morning one is the hardest I’ve realised. The one after lunch goes more quickly! No issues with drinking water at all. Like you, I leave water at work. It’s a 2L jug that I pour into a massive mug that I sip from throughout the day. I would have usually finished my 2L jug by lunch time. I’d try and force myself to drink more in the afternoon because I know I will be running right after work and I usually have a glass (or two! or three!) of wine after dinner and alcohol is dehydrating. Good move ensuring you keep yourself hydrated for exercise and alcohol, both of which can be very dehydrating to the body. I honestly can’t say I have drunk water from the tap for years. I boil everything (wiser to do so here) and its become such a habit, I boil them anywhere else I go too LOL! morning after wake up i took a glass of water..
before breakfast, i drank half glass of Chinese tea or green tea..finish the other half after..
at work..i bring 2L of water and i try to make sure i finish them..if not i will finish them at home..
just like you..i hv to bottle my water to make sure of my water intake..if not..I’ll lose track of how much water i’ve taken for the day especially at home. Great tips! Must show this to my sister as water is like kryptonite to her. As for me after a few bouts of UTI in my teenage years I’ve found it was essential to keep myself constantly hydrated. I’m the annoying one in the car or on plane trips that needs to take a break every hour at least. For anyone that hates the taste of water, try different types. There is a major difference between tap and bottled water, and this can differ according to the source too. Also instead of regular water try sparkling water, the bubbles help it seems. I have a few guy friends in this category: chain smokers, meat lovers, loves alcohol, dislike veges & bland food & drinking water. But they are active in sports, 4-5 days of various types of sports. Slim/muscular body type. By their mid-20’s. They find themselves short of breath. All got liver/lung issues, dry skin, swollen shadows around the eyes, dark lips. Doctors told them it’s due to the amount of toxic stored in their body esp. the liver. Which will lead to high blood cholesterol, liver failure, lung infection, hair loss. And I saw the “signs” even in their early 20’s. To cut the long story short, 6months-1year later I met them & they were cured. Wake up 2 big cup to flush out toxin. Bring 1 big bottle (Big coke bottle) to the office. Must finish before go home. Hates water. Drinks bottles of black tea & green tea only. 3 months later he went for the bodycheckup & the doctor were amazed that the danger level it’s 70% cleared. He told my friend to keep on doing whatever he’s doing (although he cannot stop smoking). Surprisingly tea also makes him less angry & crave for alcoholic drinks. Warm water 1 big mug once wake up. Add together with home made enzyme. The flavour of enzyme is sourish & will kickstart the day. ^ this is my fav.. method so far. I like to put mint leaves or chew gum then drink water. Since I’m a tea lover, I drink all sorts of flower/tea leave tea. But I’ve learned that drinking too much esp. 2-3 hours before bed time leads to water retention & puffy face/eye area. Sadly that happened to me, I had to cut down water & salt slowly to recover. This comes from a female coworker with bad mouth odour due to liver/kidney probs., she turn to Bamboo Salt as a remedy. Added it to her drinks & food. I’ve tried this method, it’s a bit costly & dangerous part is, several toilet emergencies in the morning. ..will effect one’s body in a way. I told him, Doctor.. so much of info. Fantastic article, thank you for sharing this with your readers. A great tip if you don’t like the taste of water is to add mint leaves or cucumber slices. Cucumber slices & mint in ice cold water is delicious! Hey Paris, I’m glad to hear an increase water intake has done so much for you! I did this measuring thing when I was much younger with the water bottle I took to school, so I developed a good water-drinking habit from a pretty young age! I actually don’t know what it does for me (since I’ve been doing it for so long), but wherever I am it seems like I’m constantly drinking water 😉 I do need a lot of restroom breaks, but it’s probably better than the problems that come with not consuming enough water! Haha I drink herbal infusion (GINGER) when it’s cold! I pretty much do it all year round to be honest (not when it’s 30+ degrees outside but how often does that happen?). I’ve long been known in my family as an advocate of getting the required amount of water everyday. I try carry a water bottle with me everywhere: the living room, the study table, when I go out (if I can, without look like a dork), going about doing household chores etc. And if I ever forgot or is unable to bring my water bottle with me, I’d consciously remember to drink water whenever I can. It makes A LOT of difference to your overall wellbeing. I used to be on the other side of the fence, and I was sick very often. Being lethargic all the time is just the beginning of my day. After making a conscious decision to start adopting a healthy water intake amount, I can really see the change. In the beginning, I would keep track of the numbers of bottle I’ve drank throughout the day. After while, it became a habit, and I don’t need to “count” anymore these days. Yay Water! 😀 I’ve started carrying water when I go out on weekends these days. I find I tend to forget when I’m out and about so having the bottle in my bag means I remember to drink it… so it doesn’t get so heavy! HAHA! recently installed an app..where it send reminder for every hour…that way I can monitor the water intake as well..